Healthy Egg Salad is a classic crimp, but with a lot of mixed Mayo, Dijon mustard, chopped parsley, sweet pickles, and celery. It can be high in fat, cholesterol, and calories. 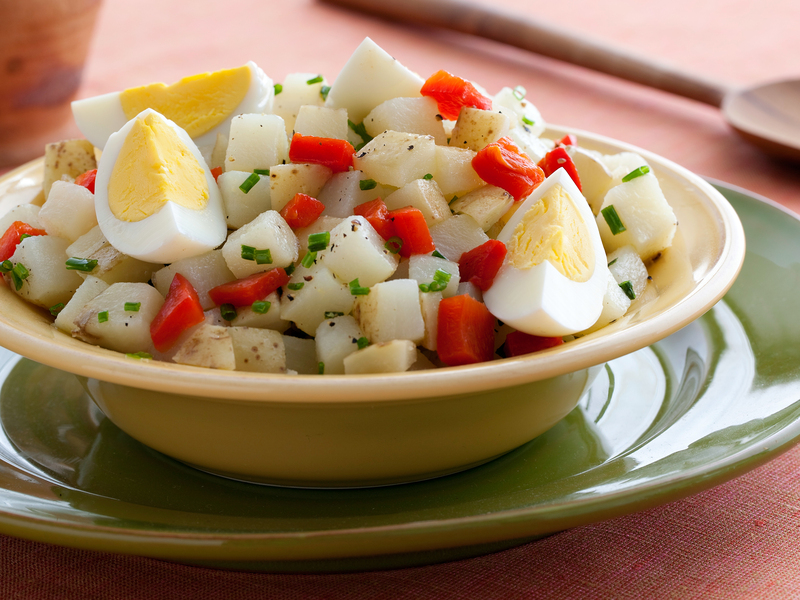 Try these new takes on traditional health egg salad recipes. Take a saucepan, add some water and boil eggs for 10 minutes. Drain hot water and cool under cold running water and remove the shell. Roughly mash the eggs in a large bowl with homemade mayonnaise (or hummus) and dijon mustard. Fold up in the parsley, pickles, celery and sun-dried tomatoes (if using). Add salt and pepper to taste. Serve on sprouted whole grain toast. 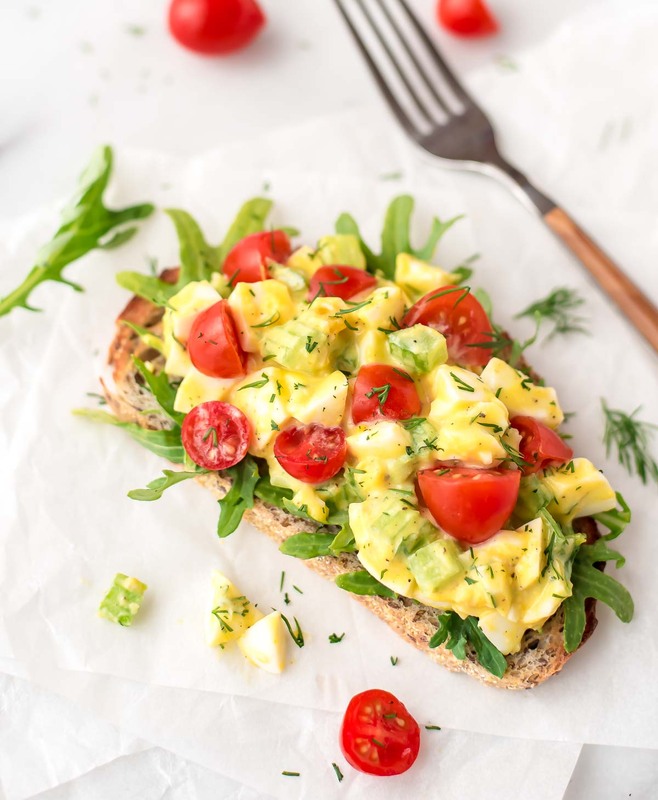 Healthy Egg Salad is an easy food for sandwiches, and my version is made healthier by using Greek yogurt, and it became so creamy dreamy delicious. No matter how you serve skinny egg salad- as an appetizer with crackers, over greens, as a sandwich spread or wrap-style; it’s always a picnic favorite. Take the pan, add a little water, boil the eggs for 10 minutes.Drain hot water cool egg with running cold water and peel eggs. Now slice each egg in half and place in food processor. Pulse 10-12 times until the eggs break into small pieces, be careful not to overdo and mash the eggs (you can also roughly chop eggs with a knife). In another bowl put yogurt, mayonnaise, dill, salt, and pepper and beat together. Add chopped eggs and mix with a fork lightly until well combined. 1. 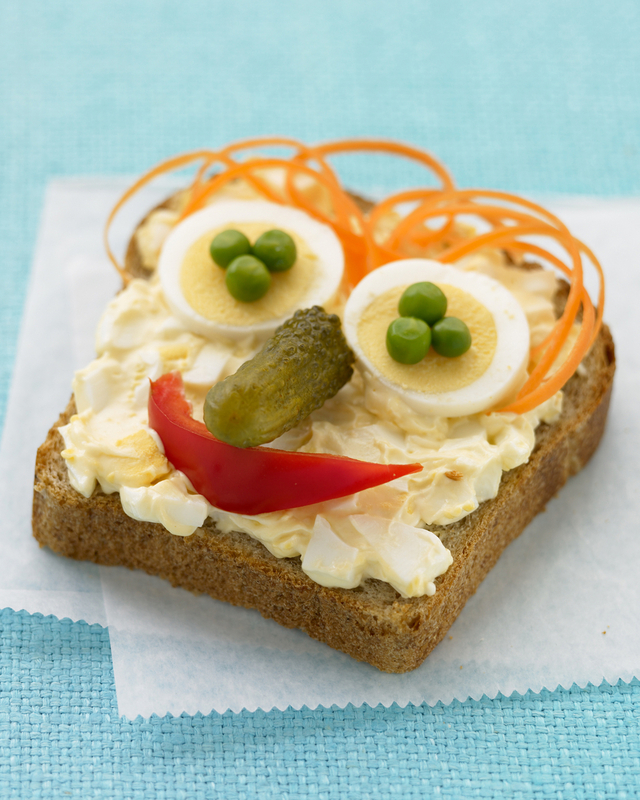 For a sandwich: 1/3 spoon egg salad on a split roll or croissant; or use sandwich bread. Add lettuce leaves or other greens to the sandwich, if necessary. 2. For pita: Put lettuce leaves or other greens inside a pita. 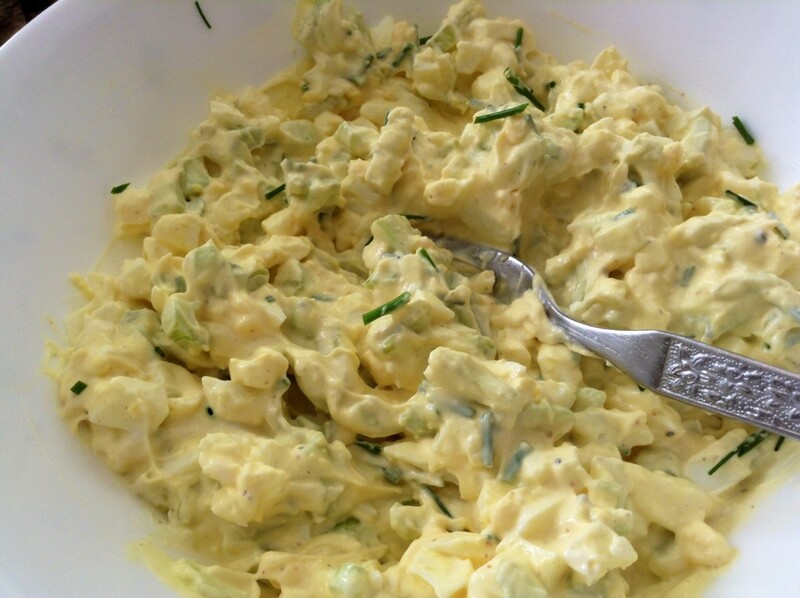 Fill with 1/2 cup egg salad. 3. 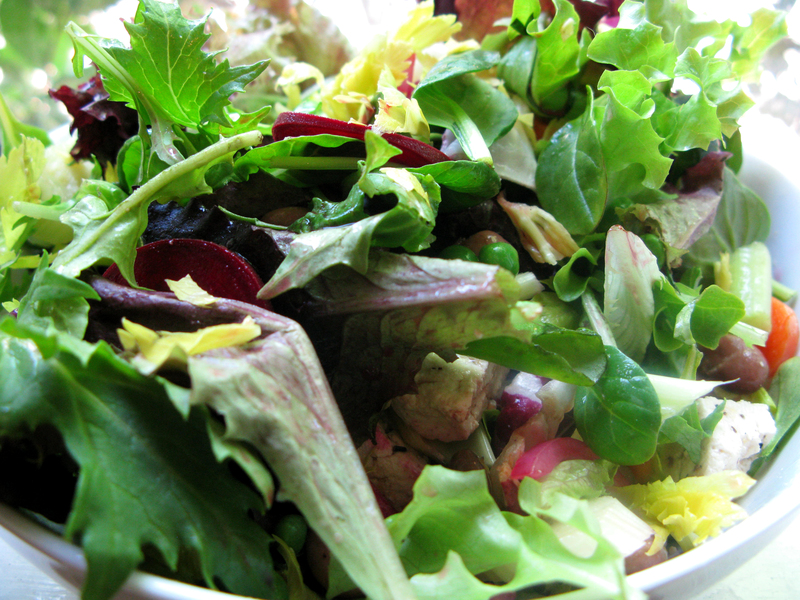 For the salad: Add a 1/2 cup egg salad on top of a bed of lettuce leaves or other greens. 4. In tomato flower: Put in 1/2 cup egg salad inside a tomato which has cut into a flower shape. 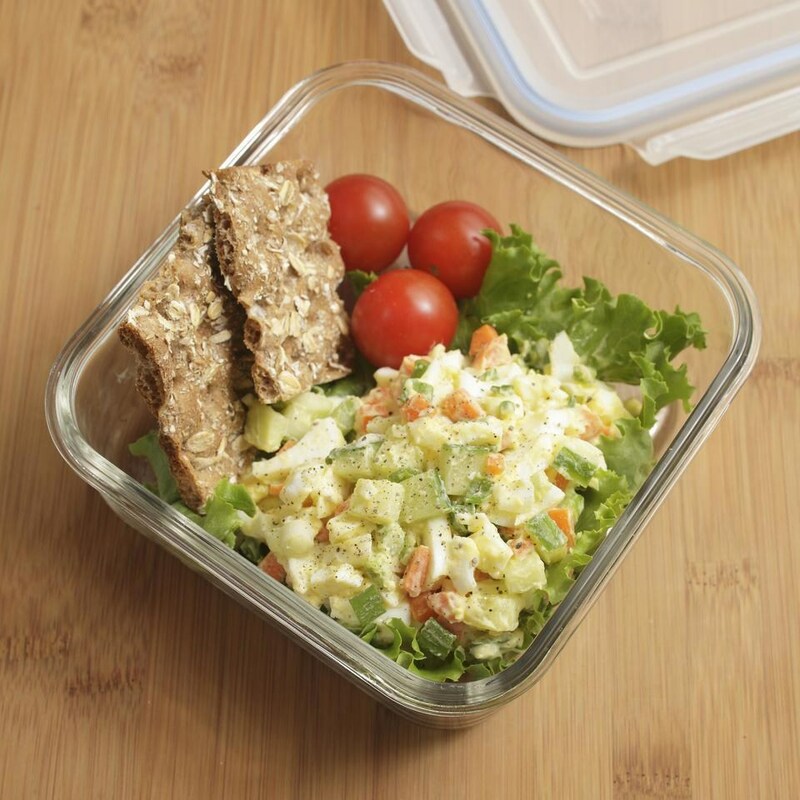 Healthy Egg Salad with Crunchy carrot, cucumber, and scallions are a colorful addition to this vegetarian recipe. Pack it with few crunchy crackers and tomatoes for a healthy, light lunch. For hard-boil eggs, place eggs in water a single layer in a saucepan. Bring to a boil over medium-high heat. Decrease heat and boil for 10 minutes. Remove from heat, pour out hot water and cover the eggs with ice-cold water. Let place until cool enough to touch before peeling. Mix yogurt, mayonnaise, pepper and salt in a medium bowl. Divide eggs into tow pieces and discard 4 of the yolks (or save for another use). Add whites and the remaining four yolks to the bowl and blend to desired consistency. Add carrot, cucumber, and sliced scallions fold gently. Healthy Egg Salad is a healthier version of a classic salad. Serve with whole wheat bread also use this salad in parties and picnics. Take the pot, add some water, boil the eggs for 10 minutes.Drain hot water and leave to cool then peel eggs. Mix hard-boiled eggs using a fork in a bowl; add mayonnaise, celery, carrot, red onion, Dijon mustard, vinegar, salt, and hot pepper sauce. Mix it thenRefrigerate until chilled, at least 30 minutes. Healthy Autumn egg salad made with sliced apples, celery, and grated carrots so that it is slightly sweet and so crisp. And this is done with plain Greek yogurt and low-fat mayonnaise, which means my recipe Makeover lighter than the classic egg salad. Boiled eggs and peeled then roughly chopped with knife Place the eggs, apple, carrot, celery, Greek yogurt, mayonnaise and honey mustard in a large bowl and mixed until well combined. Season with salt and pepper to taste. Serve on its own, on top of lettuce leaves or in a sandwich.